Patina: Medium brown. Surface: peened background. Editors mark in raised letters, lower right: E.B. EDIT. Illegible founder’s stamp in diamond form, lower center. Engraved inscription along lower edge: V JANVIER / E. FREMIET Scp. 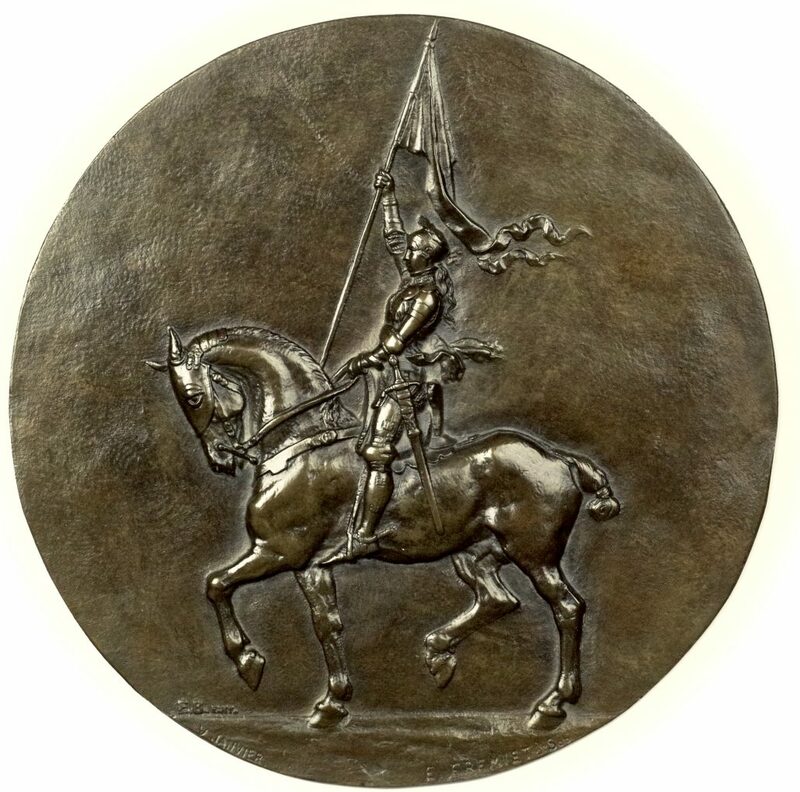 The medallion of Joan of Arc on horseback proudly brandishing the standard of Charles VII, viewed from below with torso erect and legs energetically extended, is a translation of Frémiet’s famous monument into relief form. Situated directly across the street from the Palais du Louvre and the Tuileries Gardens, the golden sculpture dominates the Place des Pyramides. The first version of the work was commissioned by the French Government in 1874 shortly after the Franco-Prussian War. After a crushing defeat at the hands of the Germans, the outcome of which resulted in the country’s losing two of its cherished eastern territories (Alsace and Lorraine) and, following closely on its heels, the wanton destruction caused by the Paris Commune (where a wing of the Louvre Palace and the Paris Town Hall were burned to the ground and where the column of the Place Vendôme was toppled), France was in sore need of symbols to heal its wounds of humiliation and to help efface them from collective memory. State sponsored sculptures with themes of redemption and re-conquest began proliferating on the capital’s public squares. As a case in point, Mercier’s spectacular sculpture employs an angel with outspread wings. She cradles a dead warrior with broken sword in her arms and wafts him heavenward. The work’s consoling title in Latin, Gloria Victis, affirms that there is glory even in defeat. The Latin language sends a signal understood by all. It was certainly not the first time France had taken a beating. Vercingitorix – whose legend had been greatly amplified by the recently exiled Napoleon III – was vanquished by Julius Caesar’s Roman army. In defying them, however, the valiant Gaul founded a new and powerful nation. By comparison, Frémiet focusses on a more positive, and possibly more uplifting, story. He does not go into unpleasant considerations of death, even if they are tempered by redemption. He rather depicts The Maid of Orleans at the height of her prestige. She is represented on horseback as a victorious conqueror, enjoying the fruits her successful military campaigns that routed the occupying English army. It was no mere coincidence that the sculptor chose as his model, to incarnate the heroine, an 18-year-old girl exiled from the Lorraine. Emmanuel Frémiet, nephew of the sculptor, François Rude (author of The Departure of the Volunteers on the western face of the Arc de Triomphe in Paris), and father-in-law of the composer, Gabriel Fauré, is one of the glories of the late XIXth century French School. A virtuoso at modeling both human and animal figures, his representation of Jeanne is second to none. The excellence of his second version, installed 26 years after the first (where the scale of the horse is reduced to give its rider greater stature and where other small details are corrected), in addition to a revival of interest in the story of the heroic maiden that saved the French nation, assured its extraordinary success. Frémiet’s monument was installed in the cities of Lille, Compiègne, Saint-Etienne, New Orleans, Philadelphia, Portland and Melbourne. The reductions of the monument, produced in the hundreds, were a best seller and they garnered a small fortune for both Frémiet and the foundry that produced his model, Barbedienne. Frémiet’s medallic relief is known in differing sizes, the most common being commemorative versions that measure 37mm or smaller. Our large medallion, measuring 174mm, is an extreme rarity. Given the care lavished on its execution and its scarcity, it is possibly a sand-cast prototype that was not produced commercially in significant numbers. At the time of printing of the Frémiet catalogue raisonné by the Musée de Dijon*, a medal of Jeanne d’Arc Equestre is cited as N° S 317. However, the reference is neither accompanied by an illustration nor details regarding its size and medium. *Catherine Chevillot, Emmanuel Frémiet, 1824-1910, La main et le multiple, Musée des Beaux- Arts de Dijon / Musée de Grenoble, 1988.